BRC invited each candidate and listened to their goals, background and perspectives up close. Our attendees were able to ask questions, get answers and openly engage each campaign across 2013. Our choice for NYC Mayor is Joe Lhota — we urge our members and their neighbors to vote for him on Sept. 10 and on through the general election. He’ll make an outstanding Mayor. 1. His potential to lead NYC and his sacrifice is second to none — across both Parties. Unlike any other candidate, Mr. Lhota sacrificed a lucrative career as Chairman of the MTA — to take the chance of running for the Mayoralty, essentially as a call to duty in our recessionary times. Many BRC members responded to that sacrifice, as a requisite of what true leaders do. (Contrast this with Democrats that are running for Mayor — while being paid in other capacities and actually campaigning during middays in Elected Offices — Comptroller, Public Advocate, Councilmember, etc.). Mr. Lhota has Rudy Giuliani’s support for Mayor because helped in both Giuliani terms in leadership positions – serving as First Deputy Mayor and Deputy Mayor of Finance and Operations, and before that leading Economic Development. His management style has also been honed across the private sector (a background that Mayor Giuliani didn’t possess). He knows what to expect and what to prepare for — and methods most effective for working with NY’s communities. Joe Lhota recognizes that he learned on-the-job within City Hall, and has insight about communicating and outreach. For those reasons, and because he’s his own man — we believe he can be an even better Mayor than Rudy — more inclusive and capable of starting quickly without even a day of any lagging for learning how Government works in any way. 2. 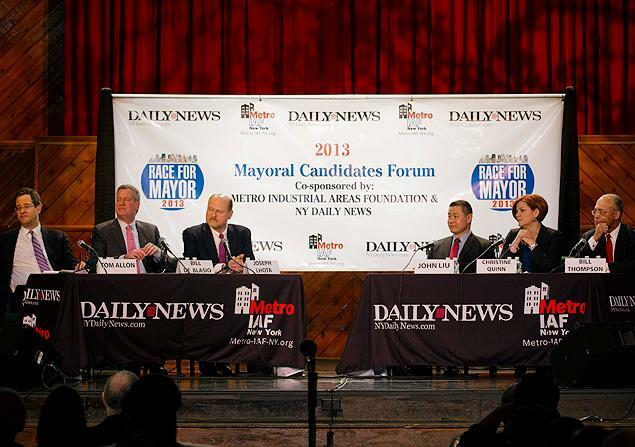 In citywide Mayoral 2013 forums, he’s shown a commanding knowledge. Mr. Lhota has a perspective of one that has already seen the depth of the issues. Other candidates talk in generalities, or conjure grandiose promises. Lhota has gotten applause speaking about Housing-policy and NYCHA’s issues in Bedford-Stuyvesant. He understands and respects City uniformed workers, and roles of unions – but aims to be reasonable. He’s relayed the struggles of Small Business, taxation and how jobs can be created – knowing how everything in the City works in synch. He’s already lessened the size of government in a challenging economy, by attrition and cutting excess spending. He has spoken on Education in specific terms, about its challenges – and options that escape other candidates that are far less familiar with the role they covet. He knows the City from Hunts Point to the West Shore of Staten Island, back to Far Rockaway. Our BRC members have questioned him across two meetings – and he seems unaffected by any special interests. He makes clear, intelligent points. One member added: “He seems far less likely to manipulate in back-room dealings.” We trust he’s the person to lead the City and base consideration/decisions on merit. 3. There has never been a Mayor in NYC’s history with Lhota’s in-depth understanding of our Transit system, the MTA and internal processes. While there are steady pot-shots — Mr. Lhota has explained how tolls were increased and that the NY Legislature had also added future increases (to come every 2 years). One BRC member feels this strength is a slam-dunk: “notice that transportation is never an issue — at any forum with either Party? — because he owns that issue.” Joe Lhota offers NYC what it never had – no Mayor has ever had a first-hand knowledge of operating procedures, “the two books” and hands-on experience leading the MTA/transit system and Authority. He knows exactly what is B-S and what our transportation systems need. This is an advantage, when interacting with the MTA, State legislature and Governor moving forward, on our behalf. When Superstorm Sandy crippled our transportation system – Joe Lhota’s leadership was well-regarded, universally recognized and widely reported across the nation for bringing the System back to working condition (in 2 days). 4. Joe Lhota is the choice to rebuild the Republican Party in NYC. Having a strong “2nd Party” in NYC is critical — for a better, more responsive government. We have an entrenched One Party system that “looks the other way” so often to protect its own. We accept mediocrity from local elected officials. A One Party system also creates a protective bubble for many in Office. Unemployment, crime, poverty, senior housing, jobs leaving, etc. — are somehow, someone else’s doing. NYC Democrats simply fingerprint and avoid tackling large-scale problems. Our media lets them off the hook even as the City Council has been 90% Democrats for 50 years?.. Any thinking voter wants a 2-party system, at least – and can support an intelligent option. Joe Lhota spoke at the Brownstone Club immediately after the 9-11-01 attacks as part of the Giuliani Administration, and has returned twice in this campaign season. In a City that wonders why Republicans don’t groom others for office – he is a prime example and personification of what any NYC Republican should want in their candidate. Both primary opponents have recently enrolled as Republicans in comparison. In fact, Mr. Catsimatidis has referred to himself as a “Clinton Democrat“ — but had registered as a Republican ahead of the 2009 election with a run in mind, then. Many BRC members were puzzled as to how Kings County representatives formerly identifying as “conservative Republicans” were quick to work for his campaign. Mr. Catsimatidis said that Congressman Rangel and Pres. Clinton would endorse him. George McDonald was a Democrat as recently as last year, and has gone on record (NY-1 TV forum) saying that building the Republican Party isn’t something he’s interested in. 5. BRC believes NYC has reached its tipping-point for Billionaire Mayors — and wants $ out of politics. In NYC, we have been suffering from as one BRC member put it: “just too much Bloomberg”. Members believe that NYC would vote against any billionaire again as they had with Ronald Lauder in 1989 (who was beaten by Rudy Giuliani). The election of 2009 almost made a Mayor out of Bill Thompson — who is lagging behind in the Democratic primary, right now. This means, they didn’t vote FOR him in 2009… but against Mayor Bloomberg. In fact, local Councilmember Bill de Blasio was swept into the NYC Public Advocate office despite a scant record of achievement– with his campaign, essentially having run against the Bloomberg 3rd term. Then again, we’ve seen people win even national elections, without records of achievement. The “Republican brand” has been to connected again to the wealthy – and this began in earnest with the “two Americas” campaign of John Edwards in 2008 (which attracted Bill de Blasio to the midwest to campaign for Edwards). Across the 2012 presidential season, NYC voters were barraged by an “anti-1%” sentiment that was hung onto the Republican candidate (that “only” had a $350 million self-worth, comparatively vs. the billions of John Catsimatidis). In fact, Occupy Wall Street protestors — set up across 2011 and 2012 — and never once rallied against policies of the Obama White House, nor the frequent $26k per plate mega-fundraisers. NYC has to be more savvy. 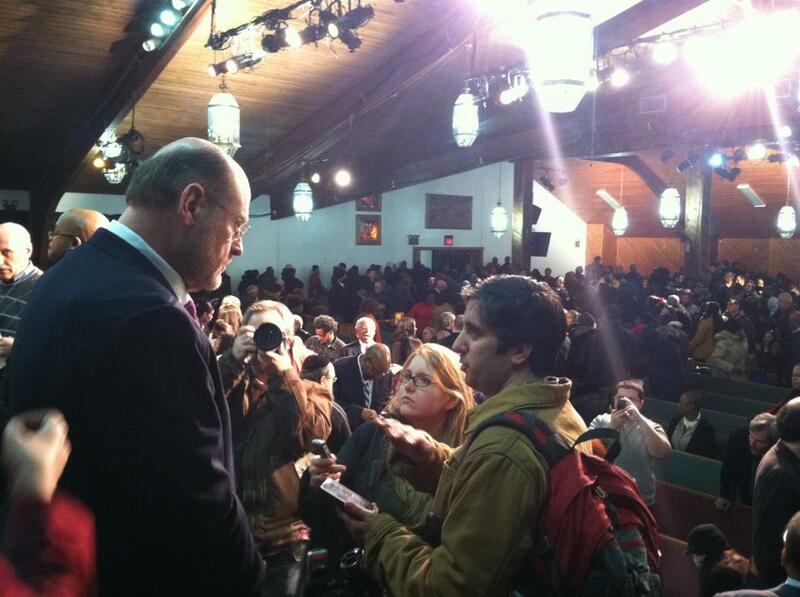 Lhota can stand up to scrutiny vs. any Democrat in any debate or forum. He can win. Joe Lhota’s communicated he’d be ready to lead “on Day 1” — and we believe no other candidate is so qualified. His understanding of our City is comprehensive. His background includes Mayoral-level government, public transportation, economic development, finance & budgeting of City agencies, interaction with all City divisions (as First Deputy Mayor under Giuliani), engaging the public at open Town Hall forums within each borough of the City, and executive management that pertains to NYC tourism with sports teams and entertainment with the NY Knicks, Rangers and Madison Square Garden oversight. He was raised in The Bronx and his father was an NYPD officer, his uncle a taxi driver — and he’s lived in Brooklyn for 26 years. BRC believes he has a unique grasp of the layers and inter-connection of life in NYC and its suburbs. Democrats in the White House and Albany are providing scant leadership on the Economy. The next Mayor also faces unions that have a signed agreement from Democratic candidates — and want retro-pay and their contracts. NYC needs far more than talk. We need a Republican that can improve our City on so many levels. We need a leader to build a team and effectiveness we can trust. We need a Mayor that can get things done without a year of appointments and disappointments. We need a leader that will not need to learn how to adapt into government as he goes along. The 2013 elections have become a circus of caricatures. Put any of them against Joe Lhota, and the voters will see the difference. He simply is the best person for the job. ← Community starts to Question Cuomo’s War on LICH.